They were very helpful - provided an air compressor for RV tires that were low. They had beautiful grounds - very well kept the campsites are spaced apart so that you had more privacy than many other RV parks. The entire Staff was very helpful and friendly. We highly recommend this RV venue. Just got here is a very clean and nice area. I was impressed so far. Close to Milledgeville Ga. large camping sights, fishing ponds on camp sight, play grounds for kids. Spent one night here. Campground was friendly, well organized and attractive. All the amenities are grouped together - nice dog run. Would recommend and definitely stay again. Our stay (entire month of March 20018) at Scenic Mountain was fantastic. We are 2 retirees, a dog and a big bird. The location is beautiful, quiet, and the sites are very spread out. There were fishing ponds and lots of hiking trails. We are in a large Class A so we' didn't use the laundry or shower facilities. The staff was very helpful and nice and the little town of Milledgeville was beautiful. We attended Covenant Presbyterian Church at 440 N. Columbia St which provided great worship and extremely friendly fellowship. We will DEFINITELY return. Great park,friendly staff. Milledgeville 4 miles away. Great history there , was Ga. capital during civil war. VERY nice park...clean, spacious sites and very quiet. Easy location for visiting Milledgeville and Macon. Would stay again if in area and highly recommend. We just completed our second visit to Scenic Mountain RV Park and Campground. This park is not only well run/managed, clean and beautiful you leave with a feeling of having just spent time with family or friends. All of those working in the park have exceptional work habits and exhibit a genuine pride in the park. This pride and enthusiasm must be contagious as you will find those visiting the park often display these attributes as well. Butch and the crew go out of their way to make certain they are meeting your needs. We have stayed in other nice parks but none compare to this one. We look forward to a return visit soon. This perhaps one of the better campgrounds I've stayed at, great staff, great clean grounds, quiet and friendly. Well maintained and flexible, if only all campgrounds could be so wonderful. We love to know that our guests are happy with what we have to offer. Thank you for telling us and the world hos much you like Scenic Mountain. Please visit us again soo. Our Sunny Peaches RV Club Camped here several weeks ago, having 14 rigs attend. Everyone on the staff and work campers were especially friendly, courteous, helpful, and kind to all of us. Sites were clean, power was strong, as was wi-fi. Bath houses were kept clean and stocked well. Our club will probably return to this campground in the future for group campouts. Very clean and well maintained campground. Very friendly staff. The only thing that confused us was all the stipulation to the fishing. All we seen to be able to catch were the ones we could not keep. We do plan on coming back for the camping. This was our 2nd stay at Scenic Mountain RV Park in our 31’ motorhome. We enjoyed it so much the first time that we had our “Sunshine Rovers” RV club join us this year for the Milledgeville Deep Roots Festival. 12 Rigs were in our group. We stayed for 5 nights. The Campground Marketing Manager went out of her way to make sure that each of us had everything that we needed. We had use of the Club House and the kitchen, which made serving and eating our group dinner and breakfast a real treat! The campsites are well spaced and have full hook-ups. The campground facilities are kept very clean and it is obvious that the staff takes pride in their work and in the park. There is a clean dog park equipped with agility type equipment for exercising your canine partners. The park is located only 3 miles south of Milledgeville, GA, which we found to be a very friendly community. The WiFi was flawless, which is NOT usually the case at many RV parks. We stayed for 5 nights. Cell phone service was excellent for all of the carriers that our group uses. We have already made our reservations for October 2018! I highly recommend this campground. I was thrilled with the beauty of this park. Large spacious sites, good wifi and cable tv for one low price. The owners and campground staff were friendly and helpful throughout our stay. If you are in Georgia you should stay at this park. This is one of the nicest campgrounds we have encountered. As travelling workers my husband and I travel the east coast so we have seen many campgrounds. This one is immaculate. The staff is accommodating and friendly. The bathrooms are spotless and the spaces are roomy so you dont feel cramped. Do yourself a favor and stop by this lovely place. Thank you for your kind words. We are very glad you found the park immaculate. Our great staff keeps it that way. We were only able to stay overnight in this beautiful and well-maintained park but hope to return for a longer stay in the future. We were in a back-in site that was large and level and close to the bath house and restroom. The staff was exceedingly friendly and helpful. Thank you for your kind comments about our staff and the park. We could not offer to our guests a well maintained park if it were not for our hand picked staff. This RV park is now one of our favorites. The sites are spacious and level. And we were amazed at how much green space is available all around the park in addition to the hiking trails and fishing spots. The park is clean, very well maintained, and extremely quiet. A big thumbs-up all around. 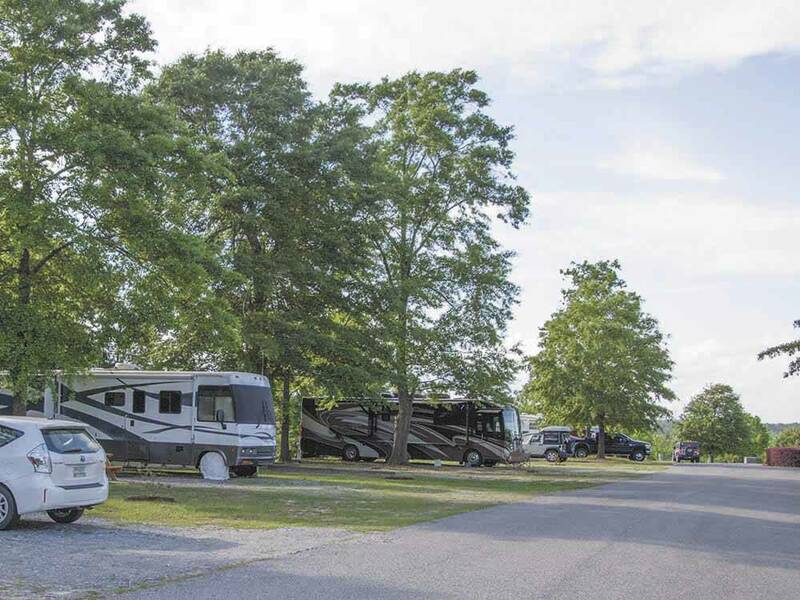 We are very glad that Scenic Mountain is one of your favorite RV Parks and that you like that our sites have lots of space and our fishing ponds and hiking trails. Our great cleaning crew is the one that keeps the park spotless. Please come back soon. We would love to see you again. Awesome rv site.I've stayed at quite a few rv parks/ resorts/ campgrounds, and this one as of 2017 has ranked the best. Great staff, The CLEANEST place I have ever seen.This park has it together. Nice spacious sites, all with fire rings,walking trails throughout, and are you ready for this?.....several fishing locations on the premises.The pool looked new and was crystal clear. The showers/ bathrooms were spotless. I think what I liked most was ( every building or facility was painted and it had bright lettering indicating exactly what it was.) Hats off to the maintenance staff, you have to appreciate going to a place that not only verbally welcomes you, but uses the appearance to say it as well. This rv park doesn't need me to tell potential customers how good it is, they have a great site, great staff and great rates, The facts speak for themselves. Thank you so much for your kind words. We are glad you liked what we had to offer and our staff. We would love to have you as a guest again. Please come back. Georgeous park. Well maintained and sites are spaced apart. Customer service is excellent. We will return and highly recommend. You will not be disappointed!! Thank you for your kind words. We are glad you enjoyed your stay and are planning to visit us again. Staying at Scenic Mountain has been an absolute pleasure. The grounds are beautiful and perfectly maintained. Flower beds are everywhere you look and the crew is at work constantly maintaining everything. The pool is beautiful and clean. Private restrooms are available that have showers, etc. in completely private quarters. Laundry room is clean and available at low rates per wash and dryer. Beautiful dog exercise area with two dog wash stations on either side of park. The staff is friendly and willing to help any way they can. Several ponds are available for fishing. There are trails for hiking. I wish all Parks could be this great. If you are in the area... go out of your way to stay at Scenic Mountain! First time there but won't be the last. If you like clean and friendly you won't be disappointed. Excellent hidden jewel. Everything is very clean. Staff is great. Gravel level lots not crowded. Roads are paved. We will definitely return. Stayed here for two nights. The spaces are large and level gravel sites. The roads are wide and paved making backing in very easy. There are some pull-thru sites available. Large and well built picnic tables. The staff is some of the friendliest and most acommodating that I have encountered. If you are any where this campground, make it a point to stay here! If you are looking for a clean, relaxing and friendly park this is the place to be. The campground is meticulous and staff and owners are all about your comfort and happiness. I have been camping for 55 years and have stayed at many campgrounds this one makes my top five list. We are planning to come back for several stays this summer and are considering a monthly stay in the fall. Was a very clean and beautiful resort. Pool area was very pleasant. Bath houses were the best I have ever seen at a RV camp grounds. Management were very friendly. Will stay here again. Thank you for your comments. We are glad to know you are planing to be back. This is not just a campground with a manager holding it together. This is an owner operated campground undergoing incredible management. Every day the team was out working on the property and checking on us. The campground is extremely well maintained. The staff was friendly, welcoming and attentive. We travel in a 45' motorhome with tow vehicle. Our site, and many others were plenty big. There is a big dip at the entrance to the campground, but it was not a problem. Our site was on the road to the left of the pool. It is a dead end but has a turnaround for exit. The turnaround was a bit tight for us to make it it one turn. But it was easy enough to backup and pull back around to make the turn. We did not need to disconnect our tow vehicle getting into the site. But, recommend not having the toad connected until after doing the turnaround. Hilly terrain with level sites. Gravel sites, with plenty of coverage. The pool is meticulous. They have 2 dog washes that I would have most certainly used if we needed them. We'll be back. I am glad to know you are planning to visit us again. Thank you for your comment about the turnaround. We are aware of the problem and it is on the list of things to improve to make it big rig friendly. It is not at the top of the list because there are other improvements that need to be made first. Great facility. Sites are spacious and laid out nicely. Whole area is clean and Owners and staff are very friendly and helpful. Very nice camp ground. I cannot begin to praise this park enough...we are full time RVers and have stayed in many parks,this is the best maintained and cleanest park of all...kudos to them. The dog bath areas are even done with care. Please do not pass by this park,it is a gem,the scenery and hiking paths are wonderful...We will be back..thank you for enjoyable stay. Thank you so much for your endorsement! Please come back! Very nice campground, People were very friendly. Would stay again, longer to enjoy everything. Thank you. We would love to see you again! We camped here with our small Good Sam group -- a mix of fifth wheels and motor homes.. Our group was situated together near a grassy area which was perfect for gathering. We were told by a few other campers that up until the current owners took over, the campground had become less than desirable and not well maintained. In the past three years, the new management has done an amazing job in revitalizing this park. Sites have picnic tables, fire rings, gravel pads, full hookups as well as cable and great wifi (they were upgrading the weekend we were there). The grounds are well maintained, as are the roads, and the ponds are so pretty. They are supposed to be stocked full of fish -- in fact, our check-in materials included a page of the different types of fish and which ponds to fish in. I will have to take their word for whether the fishing is good since none of our group took advantage of that amenity. There is also a dog park which several of our members visited, and even a dog bath. (After all, they are customers too!) The pool was not open during our stay. Bath house had separate private "bathrooms" where shower, toilet and sink were all in one room with locked door. Very private. Very clean. Even had seat covers! We did not use the laundry facilities. The office has propane, and large bags of firewood, and some basic camper items but no perishable groceries since you are close to town and groceries, et al. One thing we liked was that this campground does not usually book multiple groups at the same time. This allows a club to have access to facilities that they need without competing with another club for time/space, as our group has had to do at other parks on occasion. It also keeps other campers from feeling overwhelmed by too many groups. The thing we especially enjoyed was the great customer service! The owner and marketing director are truly customer oriented and genuinely are interested in your having a quality experience. They went over and above in accommodating the needs of our group, even finding us covered/heated shelter when the weather broke up our planned outdoor gathering. They came up with tables and extra chairs for us as well. We met two other work campers while there and each displayed that same friendliness and helpful attitude! All of our members had an enthusiastic "yes" answer to the question of whether we would come back next year. We are looking forward to it! Highly recommended. Thank you so much for your review. It is that kind of response that give us the energy and willingness to keep improving the park. Knowing that all of you liked the facilities and felt welcomed is really important to us. We are looking forward to seeing you next year. 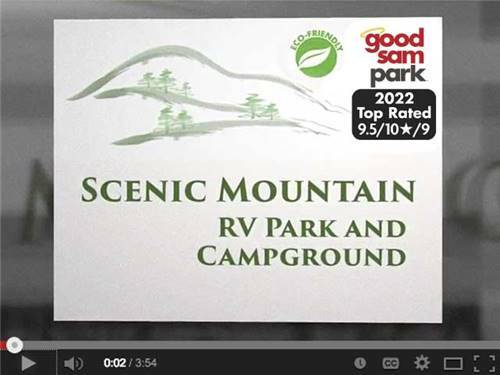 We booked four nights at this wonderful RV park based on Good Sam reviews. We were not disappointed. From the grounds, the sites, the amenities and the staff, we were so impressed with everything and everyone we came in contact with. The sites are huge, the views are gorgeous, bathrooms, showers and clubhouse are wonderful. The staff were welcoming and helpful, helping us get acquainted with the area and gave us lots of information about the wonderful town of Milledgeville. We loved it so much we added another night to our stay and rebooked with our family for July. There's nothing not to love in this great park. Very nice park, scenic view is unbelievable and beautiful. Would definitely stay here again. Staff were very friendly and outgoing. Made us feel at home. Restrooms/showers were clean and well supplied. We stayed at Scenic Mountain RV Park for 5 nights in our Class A motorhome. Their staff assigned us to a site that did not meet our needs, but they provided us with a suitable alternative site. The office staff was readily available and always responsive to your needs. The ground staff interacted with us each day, and they were friendly and always asked if our needs were being met. The staff always tried to make us feel welcomed and special. The town of Milledgeville offers a prolific venue of history and southern charm. We will definitely be coming back to Scenic Mountain RV Park, which is only 3 miles south of Milledgeville. The park has a clean dog park equipped with agility type equipment for exercising your dogs. I highly recommend this campground. We love this campground!!!! Love the people, the staff always makes our stay a good one. Love the lakes for fishing!!!! Also the sites are large enough for privacy. Our dog loved it there. lots of room for playing. Don't hesitate to try this place, IT'S AWESOME!!!! Didn't use the restroom, so couldn't rate it!!!! Thank you for your kind comments. We are glad you and your dog loved the park. Please come back! Very clean campground with extremely friendly staff. Bathrooms were private and clean. It was Labor Day weekend and the other campers were friendly, quiet, and enjoyable to be around. The kids had a great time swimming in the pool and walking to the lakes. I was able to fill my propane and stores for convenience items were close by. They had live music one night and made smores with the kids. Well kept park, very clean with good space between campers. Good water pressure, level sites, reliable power, and happy, friendly staff. I will be back to visit again. My husband and I were looking for a quick getaway for Labor Day weekend and picked this campground out of the blue. We were greeted by an amazing staff upon our arrival. They were super friendly and most helpful of information regarding the area. We were given some great ideas of things to do and places to visit. We spent 4 nights at this campground and loved every minute of it. The amenities were fabulous, the campground was very clean as were the bath houses. The evening before Labor Day the campground provided all the guests with some live music entertainment which was delightful and offered free smores for everyone. We will definitely go back and encourage others to visit. We stayed in the park Memorial weekend. We walked on 2 of the trails at the park and spent time at the pool during our visit. Had a great time. Very relaxing, plenty of space between sites. The owners spent time at the pool chatting about the improvements they have made in the park and some of the improvements they are going to make. We plan on going back in August and also renting the cabin they have to allow family to come spend the weekend with us. It is really encouraging to know that people like you are planning to come back. Butch and I are looking forward to seeing you in August. Awesome RV park quiet and large sites plenty of room for slideouts. Owners and camp staff work hard to maintain park and constant improvements always happening. We liked this park so much extended our stay to relax and enjoy ! restaurants and shopping not far ,dog friendly and some nice views of the mountains. Beautiful campground. We camped on #5 on top of the mountain and you can see the city lights at night.....great view. This was our first stay in our new RV, very helpful owners & very quiet!! We will be going back. Echo other reviewers. Friendly & helpful staff, friendly campers/residents, campsites have space between them, attractive park with trees (provides barrier to road that runs along one side of the park) & hills. Would be very helpful to have more restrooms/showers. A few more laundry machines too. Enjoyed my stay & yes, would return if in the area. The new owners have really worked hard to provide a welcoming & CLEAN park. It shows. I am glad you found the park attractive. You are right. We don't have enough bathrooms or washing machines. In the very near future we will be adding 3 more full bathrooms to the bath house and we will install another 3 full bathrooms (one of them handicapped accessible) close to the swimming pool and the club house. We will add to the outside of the new bathrooms a pet washing station. We are also planning to add another laundromat and 4 more bathrooms at the North end of the park. I am so glad you decided to stay longer because you liked the park. We keep making improvements. Please come back and you will enjoy your stay even more. This was an accidental find, one night stop over enroute to another destination. Very pleasantly surprised... the campground was very clean and well maintained. Camp sites were spacious with most, but not all equipped with picnic tables and fire rings. Roads are paved and trailer pads level and gravel based. Small fishing ponds and short hiking trail are nearby. I always remember where I've been and I'm sure I will be back here sometime in the future. This campground is meticulously groomed and clean. Every site is level and most have a very nice picnic table and fire ring. Every camp worker I came in contact with was polite, friendly and helpful. Office staff did everything possible to make your stay comfortable. Lots of up-grades in progress. I will be back and highly recommend this to any and all campers. We are very glad you found your stay enjoyable and that you liked the improvements we are making. Please come back soon. We enjoyed having you as our guest. This is a gem of a park the staff and owners are amazing. The location is clean and very well maintained. The lots are HUGE and well graded almost perfectly flat. WE only had one minor complaint about the how trip was that you only had one restroom with one shower for male and same for females. If you had two or three more this park would be a 10 of 10. If you are self contained and not staying here in the milledgeville area you are crazy this is a must return even with the limited facilities. Thank you so much for your comments. You are right, the bathroom facilities are not enough. We are very aware of that and as soon as we are finished building the new club house (it has 2 bathrooms - no showers - one of them handicapped accessible), we will start a new building that will house 6 full bathrooms. Very spacious parking spaces, friendly helpful employee's. From Flyboarding to Archery, the area is full of action! Lake Sinclair has guided flyboarding tours, boat rentals & water sports. 40 miles and you are at the Rock Hawk Effigy & Trail where you will find a lake, river, wetlands, forest, plus educational displays & archery ranges.